Loading up and ready to ship to NYC – Just arrived and getting ready for showroom. We just received a new shipment of merchandise. We think a good selection of classic pieces and a few interesting oddball items for good measure. Many of the pieces will have to be cleaned up before going into the showroom but that is defiantly part of the process that allows the merchandise to be shown to its best. Within the shipment is a very good set of 10 Erik Chambert sidechairs with a matching pair of armchairs that could bring the set up to 12. Please see a few snapshots below that show some of the pieces that just arrived. A Swedish Grace period inlaid birch center table, by Carl Bergsten Circa 1930s with his classic pewter inlay work. A set of three Danish beechwood and parcel gilt armchairs, Circa 1900. 19th Century paperweight with bronze serpent. Austrian painted terracotta pug, lovely surface. Over the years we have had a number of this style of chair pass through our hands. Every time we sit in one the effect is always the same. The chair, which is relatively small and unassuming, feels so much larger when you sit in it. It’s clever – the seat has the extra deep frieze, which allows it to be more padded and built up. The curve of the backrest is big enough to feel roomy but small enough to give support. The way the armrests are issued from the backrest is smooth and seamless. So we have comfort, which should always be one of the first things you address when seeing a chair. We also have a very simple detail that makes the chair incredibly functional – the armrests are raised on supports that start half way back on the seat allowing the chair to be pulled up much closer to a desk or table without hitting the armrest. Those armrests are raised on simple slightly tapered square supports with a little molding detail at the top. The backrest has a gentle curve and small scroll detail at the end. The front legs are functional, square and tapered whilst the back legs are elegant sabre form. Thoughtfully restored mahogany frame, reupholstered in a supple leather with French nail heads. For more details please visit 1stdibs.com. The long dark winter months in Scandinavia are well known, but what is less known is some of the methods they use to get through them. A simple Danish word – ‘hygge’ basically translating to ‘cozy’ describes one of the most charming ways the Scandinavians tackle the winter. Walk through the city of Copenhagen, drive through a quiet country village, sit in a restaurant or go into any home and you will always see the pure burning light of candles. Candles are used everyday and everywhere. 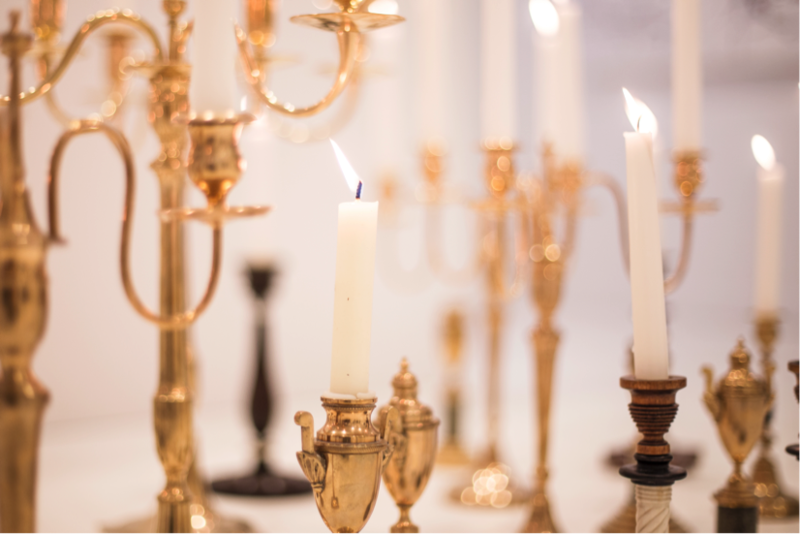 The result is the amazing variety of candlesticks that can be seen from high style ormolu and marble, graceful brass silver or pewter, simple burl root woods or ultra modern models. 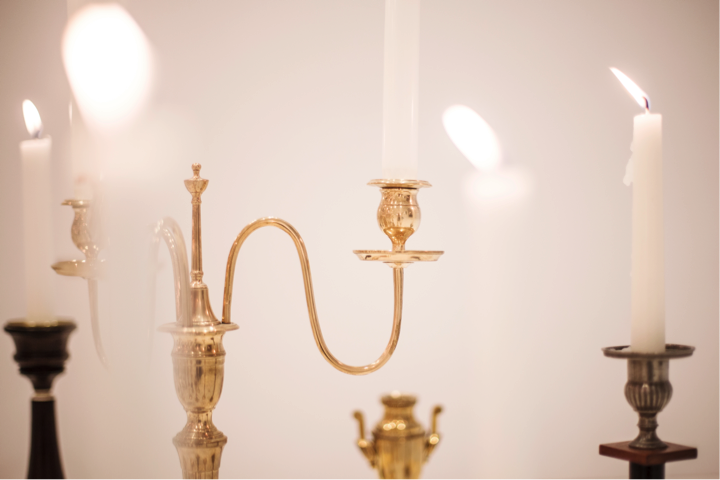 We always find ourselves drawn to collecting candlesticks or candelabras and the warmth and elegance they can add to any interior. Browse our lighting collection on 1stdibs.com. 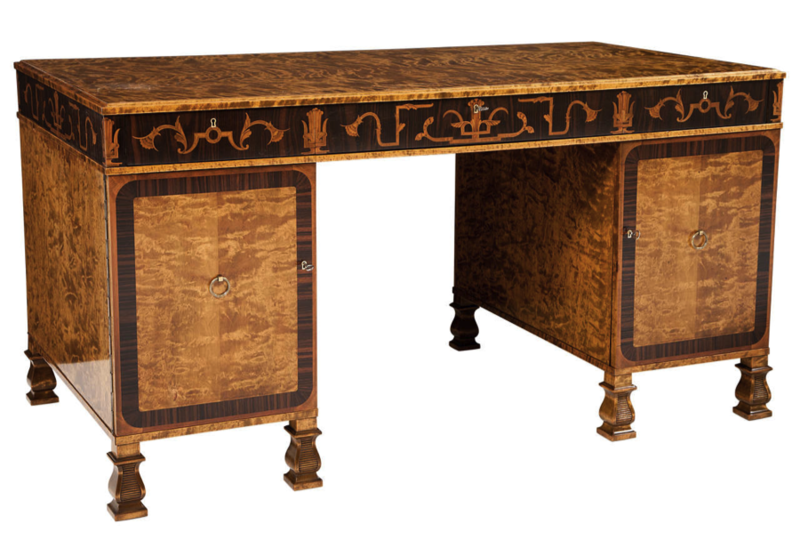 Stylized Neoclassical inlays on all sides of the frieze with particular attention applied to the corners allows this desk to be used in a freestanding manner to the full benefit of the user and viewer. We just brought this desk into the 1stdibs showroom and think the impact it makes speaks for itself. The restorer, who just cleaned and French polished it, couldn’t contain his enthusiasm while working on the piece. He expressed his pleasure in polishing a piece like this that really brings the flamed birch out as well as the contrast between the fruitwood inlays against the rich rosewood background. 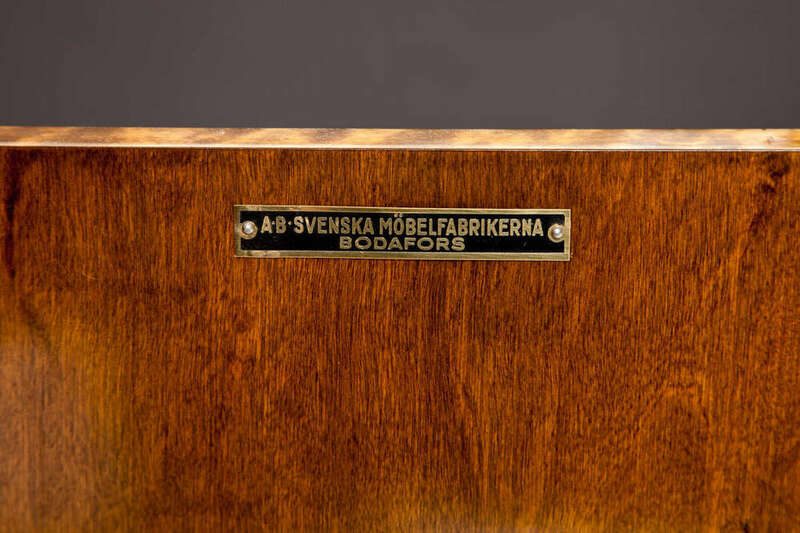 The desk is designed by one of Sweden's greatest “Grace Period” architect/designers – Carl Malmsten. The stamps and metal tags indicate it was produced by SMF. Read more about Carl Malmsten here. For more information on this piece please visit 1stdibs.com. Carl Malmsten is one of Sweden’s most prominent figures in furniture design. His designs are rooted in Swedish nature and culture. Carl Malmsten was 28 years old when he got his breakthrough, winning both the first and second price in an interior design competition for Stockholm Town-Hall. These were among the first pieces of furniture he had ever designed. Carl Malmsten wanted his furniture to provide a warm and pleasant feeling to the interior as well as being representative. A lot of inspiration came from studying pictures by Swedish national painter Carl Larsson depicting the Swedish family home. The King awarded Carl Malmsten the Professor title in 1936. 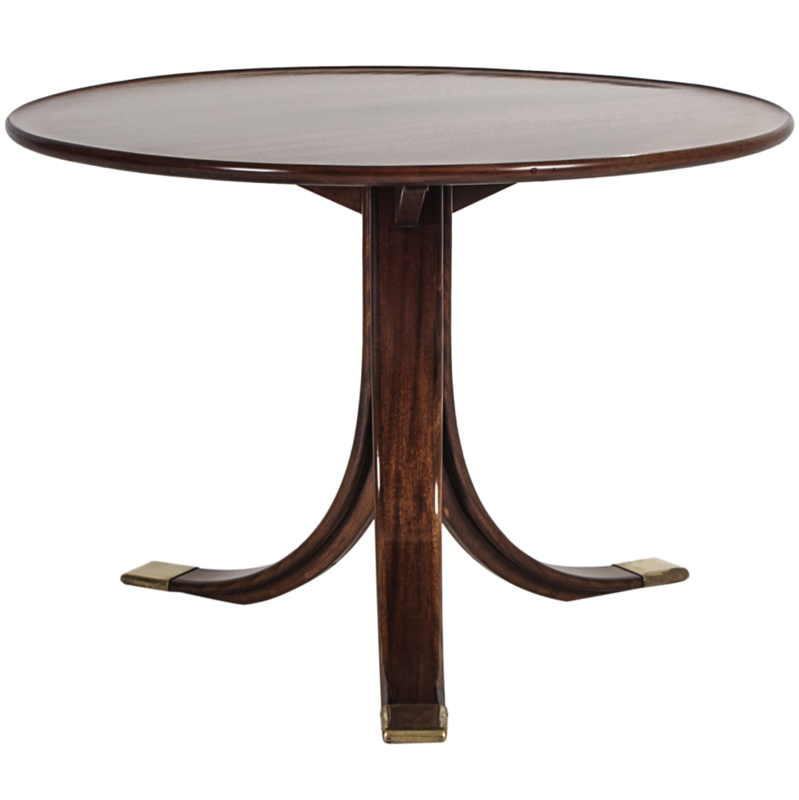 For Evergreen Antiques the classic sophisticated lines of this table combined with the superb cabinetmaking quality epitomize the work of Henningsen. This table is made in rich mahogany with brass shoes and seems to be almost emerging from the floor. The tripod base is set in a way that makes the pedestal and legs have both substance and lightness. So much of his work has the balance we strive to find – a piece that can hold its own in almost any interior. We currently have two of these tables in inventory. 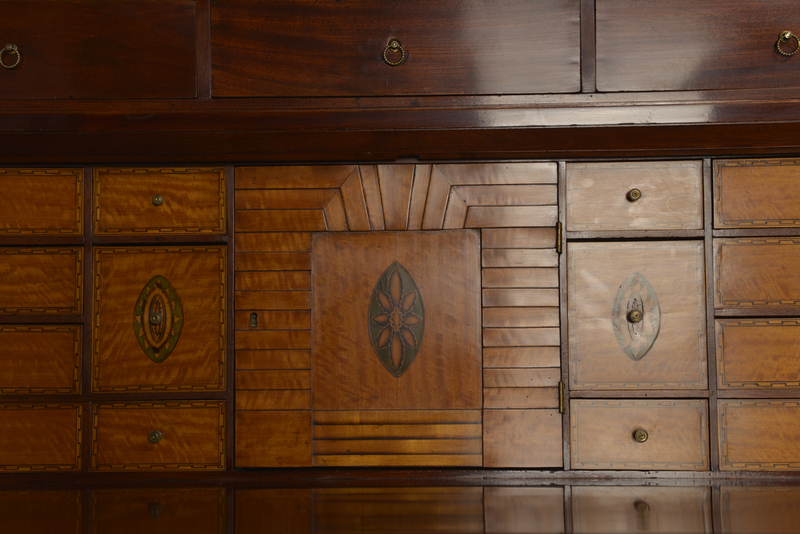 A writing bureau of this quality would undoubtedly come from Copenhagen. It would have been a central piece of furniture and certainly one of the more expensive pieces in a house. We are very much taken by the understated architectural statement the piece makes. Using a desk like this in modern interior offers height in a room but also creates warmth with its rich mahogany and fruitwood inlays. Due to its clean lines this piece could be mixed with a great variety of other periods of furniture and artwork. Quite a pleasant place to write a letter or set up your laptop! We like the sculptural as well as decorative feel of this room divider. Swedish pine wood articulating room divider, produced by Lublins in the 1940s. One end can be rolled in a cylinder and two discs be placed inside probably for plants. Even Royals need to clear out the attic once in a while and in June 2014, 1200 pieces of furniture and household effects from Danish castles were auctioned north of Copenhagen. For the first time in 60 years, the Danish Royal Family put much of their lesser furniture up for sale: desks, mirrors, chairs and even beds that used to furnish a number of castles around the country, e.g. Amalienborg and Fredensborg. One of these items has now found its way into Evergreen’s inventory. Simple clean lines, understated carving and elegant sabre legs make these stools incredibly versatile in any type of setting. So useful as additional pull-up seating, in pairs under a painting or window, or even as a cocktail table.